Forward-looking and on-trend, this sentiment echoes the co-working phenomenon perhaps best illustrated by WeWork and the emergence of “resimerical” as a term. The only trouble is that this was reported in the New York Times in 1986 — 32 years ago. This June, the National Exposition of Contract Furnishings known as NeoCon will commence in Chicago. For half a century, the industry trade show features providers of furniture, fabrics, flooring, interior building products, finishes, and technology for workplaces. This year’s event boasts 500 companies and 50,000 design professionals. It is the largest trade show of its kind in North America. For the industry to evolve, we need to think bigger. We have to think beyond June, beyond Chicago, beyond NeoCon, and beyond the boundaries of the current market. 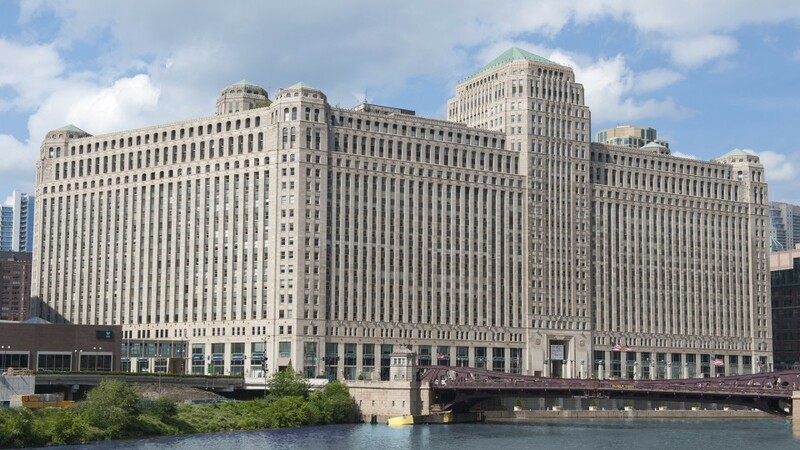 The show takes place in the Merchandise Mart, a hulking labyrinth of a building with art deco stylings serving as an all-in-one skyscraper, warehouse, and shopping mall. When it opened in 1930, the Mart was the largest building in the world in total area. It had its own ZIP code until 2008. The building has hosted NeoCon since 1969 and serves as the permanent home for many of the industry’s midwest showrooms today. This dynamic creates a challenge for built environment companies as they try to balance the needs of the show versus the needs of a showroom the rest of the year. They are compelled to be at the show and often use the effort to refresh their showroom at the same time. The split between showing the new product experience versus best seller demonstrations creates a shuffle before and after the show. The layout of the building is awkward for a trade show. It wasn’t designed to be an expo space, and compromises are made to accommodate the flow of thousands of people during NeoCon. Some elevators go up; others come down. Some floors have showrooms; some do not. There is a lot of standing in line, finding stairways and bathrooms, and looking for food. It’s hard to blame the building or its owners, and they have made improvements over the years. Still, for an industry centered on the design of the built environment, it’s not great customer experience. The key showrooms in the Mart are permanent, so the roster of exhibitors doesn’t change too often. There are temporary spaces available for smaller companies or seeking a smaller footprint. There is always jostling for position, but when it comes down to it, the industry is pretty small. Many people have worked for more than one of the players. Competitors are well known, and there are few surprises. NeoCon exhibitors invest millions in hard-earned profits into a show with a questionable return. In some industries, trade shows directly result in sales. Others, including NeoCon, are more about industry PR and team building. Trade PR can be like shooting fish in a barrel. The same companies angle for visibility from a handful of media sources. NeoCon features award-winning products, signifying achievements and making industry news. Too much emphasis here can be like talking to ourselves. However, NeoCon itself is a story and can create noise beyond the market. Many industry players have adopted a “Front of the House, Back of the House” strategy. The “front” of the house features what you’d expect at a show — new products and promotions, smiling salespeople willing to perform demos and take names. The “back” of the house includes events targeting salespeople and specific customers. The event is often one of the few times all salespeople, dealers, and reps are in the same place, which makes it a convenient to hold annual sales meetings, conduct training, and celebrate. Some showrooms feature front and back sections whereby even during the show, “back room” client meetings are happening by appointment only. This dual approach is a way exhibitors maximize their NeoCon investments. NeoCon has too much emphasis in the industry. Tradeshow booths that also function also as a showroom, and a desire for industry PR, results in a pattern of overspending. Moreover, it distracts leaders from healthier, more holistic approaches. What would happen if a competitor didn’t show up for NeoCon? Do customers care? Discussions about boycotting the event have occurred at high and low levels for decades, probably annually, but most companies are compelled to show up. In some ways, NeoCon has become an elaborate game of chicken — no one wants to blink. No major company has been willing or able to buck the system as when Apple famously turned its back on CES. Creating enough noise on your own is hard. There is movement. Some companies, even well-known ones, are migrating part or all of their showroom out of the Mart to places nearby including DIRTT, Trendway, Kimball, Interface, and most recently, Knoll. While they haven’t gone far (usually across the street), the signal is clear: These companies are prioritizing the showroom over the show. It’s a healthy step. NeoCon is vital in the industry — a global focal point as leading companies introduce new products and services into the marketplace. However, as companies seek new areas for growth, the market is becoming more fragmented. A renewed focus on end customer segments beyond the office and global outreach may shift the center of gravity from Chicago in June. Event marketing is changing. What is a marketing website today if not a 24/7/365 show? Even with the rise of digital communications, in-person events continue to be a draw. The popularity of In-person events aligns with the rate of change and the need for more information. They also offer human contact when our smartphones fall short. These factors add up to renewed energy for shows targeting healthcare, education, hospitality, retail, and residential markets, such as ICFF, BDNY, HD Expo, Healthcare Design, and more. The NeoCon World Trade Fair, as it is now known, mostly North American-based companies. NeoCon is a global event, but the pull to become more global is having an impact. European shows like Orgatech and more recently, Clerkenwell Design Week, are becoming more visible. Not to mention all of Asia, which, like CIFF in China, which can easily outpace shows in the U.S. at least by scale. 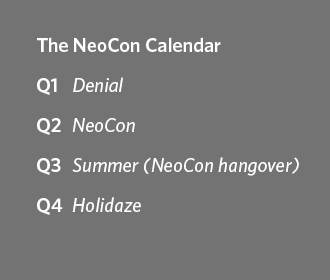 Over the years, many have adopted what I’ll call The NeoCon Calendar. Overemphasis on the show creates a ramp to hyperactivity the first part of the year, followed by a malaise in the following months. We’ve worked with built environment companies for more than twenty years, and often coach them to consider a new calendar. Don’t put off NeoCon planning, panic, and then go mandatory R&R. Instead, proactively offset the NeoCon 800-pound gorilla. Create a countercyclical strategy mapping out specific efforts in Q1 and Q3, and budget accordingly. A better calendar would plan for other shows, targeting product launches and campaigns that don’t blow your budget in one go. Take a more measured approach to ROI, systems, and thinking long term. Retailers live by holiday tentpoles, and they create more every day. It’s another way that B2B companies can learn from B2C companies. We can think of another reason to celebrate beyond NeoCon, can’t we? Change is hard. Breaking patterns can take a 12-step program and much grit. We encourage our clients to deliberately position themselves to move away from the crowd — to get more different. Resimercial is a current trend in built environments, but it was also yesterday’s trend. We live in an era of significant change, and companies that adapt will survive. How will the sharing economy affect the built environment? Will WeWork disrupt manufacturers the way Uber and Lyft are disrupting taxi services or how Airbnb is disrupting hotels? Who will be the beneficiary? Will niche providers redefine what it means to be in this space? Healthcare is already one-sixth of the economy. Stryker used to make tables; now they’re several times the size of any single furniture maker in the market. What role will technology play? WWAD (What Would Amazon Do)? Change can be scary, but it’s also exciting. Let’s think beyond NeoCon about what’s ahead and where we want our companies to be. What will they say about this time in another 50 years, at the NeoCon Centennial? Let’s not tell the same story in a new package. Let’s pivot and face a new era. Strategy is about choices. Leaders need to make them.